We got up at 3:15 a.m. for the race. I felt fairly relaxed for that first hour. The butterflies kicked in as we headed down River Road to the event. By the time Todd parked the car on Armstrong Woods Road, I was in a full state of pre-race, adrenalin-loaded, ha-you’re-not-that-calm-after-all alert. Okay, I had to put my head between my knees and I didn’t want to leave the car. I’m just thankful it didn’t hit me until then. Todd coaxed me out of the car at 5:45 a.m. and we joined the other athletes making the walk to the transition. I felt better when we arrived there. It helped to see other nervous folks, too. The women who I shared a rack with looked like they were seasoned athletes and very fit. Todd patiently waited outside the transition area for me. After I exited, he stayed with me as long as possible. 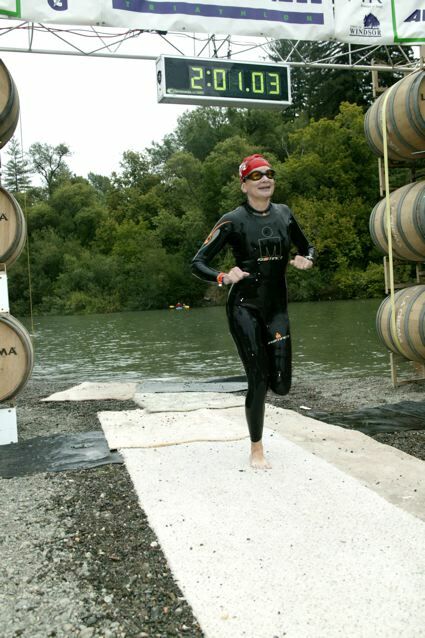 I’m pretty sure I was the only athlete getting her shoulders and back rubbed as we waited to enter the water. Definitely got a few looks. This picture above shows just how apprehensive I was feeling that morning. I laughed when I saw it on my computer. But then Todd pointed out everyone around me looked the same way – as if we’re all saying, “Do I have to do this?” “Do I have to do this?” “Do I have to do this?” I guess that made of iron feeling comes later, huh? After all what did I have to be afraid of?! 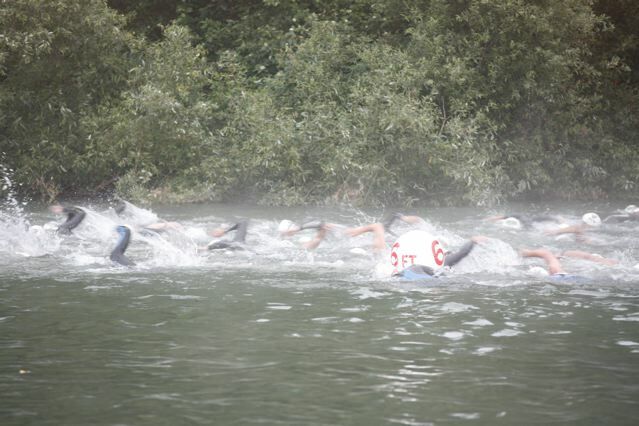 Um yeah, that – the washing-machine-like churn at beginning of swim starts gets the best of me sometimes. Okay, more often that not. Add in the fact that this was my first race in two years and a good swift kick in the goggles from a tall guy and apparently it was enough for me to have what I’m guessing was a panic attack. Never had one before, but I couldn’t catch my breath for a couple of minutes. Which made it hard to put my head in the water to swim freestyle. I assured the lifeguard, “I’m fine. I swam this distance in practice. 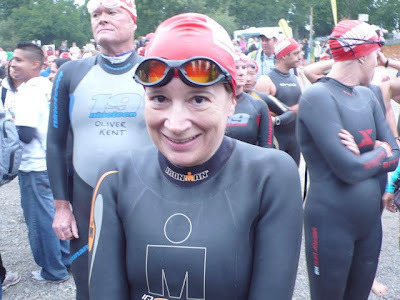 It’s just race starts get to me.” “You’ll be all right,” she reassured me “Just try to relax.” I felt foolish breast-stroking when I wanted to get going with the group. I had a couple of moments when I got pushed or hung on to more than an innocent strike of another athlete’s hand or foot. Ryan tried to prepare me for those times in the Bay. When they happened, my old martial arts mentality came out and I defended myself. One chick pushed down on my shoulder and neck. I reared back my left arm and yelled, “HEY!” I got a “Sorry!” and moved on. A mile later I felt this big, bulky guy hanging on to me. I thought ‘What’s he doing?’ and then, ‘Oh, this isn’t good.’ I ended up stopping and pushing him away from me with both arms. Which makes me chuckle now. He raised his big, bald, head up like a confused sea turtle. He had no swim cap on. I have no idea what wave he supposed be a part of but I didn’t want to give him a ride down the river. At the buoy turns I saw a lot of people walking, which seemed unnecessary and a really slow way to tackle the course. It was shallow, but you could go a lot faster adjusting your swim stroke and forging ahead than standing up and wading through it. Even though I have long arms, I didn’t need to do anything differently. For the first time in my life, I passed quite a few people in the waves that started ahead of me. I was pleased to be a little more competitive, despite my really wimpy start. I had two goals in mind: 1.) Try to complete the swim in 1:30, 2.) Try not to look like hell for the race photo and Todd when I make it across the mat. I finished in 1:36. Otherwise, I was pretty happy. They even had volunteers to strip our wetsuits off. Last November, my knee still hurt and I couldn’t fathom swimming 2.4 miles. This was a victory – no matter how I placed in my age group.